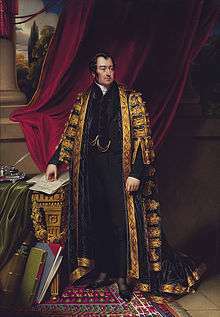 Lord Spencer as Chancellor of the Exchequer by Henry Pierce Bone. John Charles Spencer, 3rd Earl Spencer PC DL FRS (30 May 1782 – 1 October 1845), styled Viscount Althorp from 1783 to 1834, was a British statesman. He was notably Chancellor of the Exchequer under Lord Grey and Lord Melbourne from 1830 to 1834. His father George Spencer, 2nd Earl Spencer had served in the ministries of Pitt the Younger, Charles James Fox and Lord Grenville, and was First Lord of the Admiralty (1794–1801). He was married to the eldest daughter of Lord Lucan. Their eldest son, John Charles, was born at Spencer House, London, on 30 May 1782. In 1800, after Harrow, he took up his residence at Trinity College, Cambridge, and for some time applied himself energetically to mathematical studies; but he spent most of his time in hunting and racing. He was appointed a deputy lieutenant of Northamptonshire on 5 June 1803. In 1804, he entered parliament as a member for Okehampton in Devon. He vacated his seat in 1806, to contest the University of Cambridge against Lord Henry Petty and Lord Palmerston (when he was hopelessly beaten), but he was elected that same year for St Albans, and appointed a lord of the treasury. At the general election in November 1806, he was elected for Northamptonshire, and he continued to sit for the county until he succeeded to the peerage. For the next few years after this speech Lord Althorp occasionally spoke in debate and always on the side of Liberalism, but from 1813 to 1818 he was only rarely in the House of Commons. His absence was partly due to a feeling that it was hopeless to struggle against the will of the Tory ministry, but more particularly because of the death of his wife. In 1819, on his return to political life, he pressed for establishing a more efficient bankruptcy court, and of expediting the recovery of small debts; and he saw both these reforms accomplished before 1825. During the greater part of the reign of George IV the Whigs lost their influence in the state from their want of cohesion, but this defect was soon remedied in 1830 when Lord Althorp was chosen their leader in the lower house, and his capacity for the position was proved by experience. In Lord Grey's government Althorp was both Leader of the House of Commons and Chancellor of the Exchequer. He was instrumental in success of the government measures. Along with Lord John Russell, he led the fight to pass the Reform Bill of 1832, making more than twenty speeches, and is generally considered the architect of its victory. After the dissolution of 1833 the Whig government had been slowly dying, and was further weakened by Althorp's promotion to the House of Lords following the death of his father in 1834. The new Lord Spencer abandoned the cares of office and returned to country life with unalloyed delight. Henceforth agriculture, not politics, was his principal interest. He was the first president of the Royal Agricultural Society (founded 1838), and a notable cattle-breeder. Often as he was urged by his political friends to come to their assistance, he rarely quit the peaceful pleasures which he loved. He died without issue at Wiseton on 1 October 1845, and was succeeded by his brother Frederick (d. 1857). The Whigs required, to carry the Reform Bill, a leader above party spirit: he has been called "the most decent man who ever held high Government office ". Henry Hardinge, 1st Viscount Hardinge said that one of John Wilson Croker's speeches was demolished by the simple statement of Lord Althorp that he "had collected some figures which entirely refuted it, but had lost them." Spencer Street in Melbourne, is named in his honour. Spencer married on 13 April 1814 to Esther Acklom (September 1788 – 11 June 1818) at Upper Brook Street, Mayfair, London. Cokayne quotes from the Farington Diaries, "in marrying He complied with the wishes of Lord and Lady Spencer, it was not of His own seeking" and from Letter Bag of Lady Elizabeth Spencer-Stanhope, "since Jack Althorp would not propose to her, she proposed to him; and such an unusual proceeding was fraught with happy consequences ... his devotion after marriage amply compensated for his lack of ardour before." Esther died on 11 June 1818 at age 29 at Halkin Street, Belgravia, London, England, from childbirth and she was buried on 18 June 1818 in Brington, Northampshire, England. John was said to be deeply upset by his wife's death and continued a devotion to her following. ↑ "Spencer, John Charles, Viscount Althorp (SPNR800JC)". A Cambridge Alumni Database. University of Cambridge. ↑ The London Gazette: no. 15666. p. 63. 14 January 1804. ↑ Cokayne (1896), p. 202 ; who was a younger brother of Charles Spencer, fifth Earl of Sunderland, who later became third Duke of Marlborough. ↑ Burke (1931), p. 2202 ; daughter of the Duke of Marlborough. 1 2 3 4 5 6 7 8 Cokayne (1896), p. 203. ↑ Cokayne (1892), p. 82 ; son of Rt Hon. 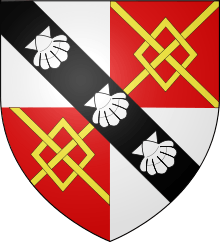 George Carteret, Baron Carteret of Hawnes, Bedfordshire, and his wife Grace Carteret (née Granville), Countess Granville. ↑ Cokayne (1896), p. 202. ↑ Cokayne (1892), p. 83 ; daughter of Sir Robert Worsley, fourth Baronet, and his wife Frances, daughter of Thomas Thynne, 1st Viscount Weymouth. ↑ Cokayne (1896), p. 203 ; daughter and coheir of her father. ↑ Banks (1837), p. 24 ; daughter of "Lieutenant-Colonel Collyer". ↑ Cokayne (1893), p. 170 ; of Lucan, county Dublin. ↑ Cokayne (1893), p. 170 ; coheir of her father. ↑ Cokayne (1893), p. 170 ; daughter and heiress of William Sarsfield, elder brother of General Patrick Sarsfield. 1 2 Does not seem to be named in published material ; see also Weaver and Mayo (1895), p. 182. ↑ Cokayne (1896), p. 203 ; of Canons Leigh, Devon, and of St. Andries/Audries, Somerset ; very often spelt "James Smyth". ↑ Chadwyck-Healey (1901), p. 317 ; his will granted administration in 1740 ; of Pixton. ↑ Cokayne (1893), p. 170 ; Bartlett (1865), p. 87, transcribes a monument thus: "Margaret Countess of Lucan, widow of Charles Earl of Lucan, and daughter and co-heiress of James Smyth, of St. Audries, in the county of Somerset, Esqr., and of Grace Dyke, of Pixton, in the county of Devon, his wife". ↑ Chadwyck-Healey (1901), p. 317 ; her will proved 1737 ; daughter of Richard Blackford, of Dunster, a Master in Chancery, d. c. 1689, and his wife, Elizabeth ; her will mentions Grace Dyke and her husband James Smyth. T.C. Banks (1837). The Dormant and Extinct Baronage of England, volume 4. W.A. Bartlett (1865). The History and Antiquities of the Parish of Wimbledon, Surrey. E. Brydges (1812). Collin's Peerage of England, volume 3. A.P. Burke (1931). 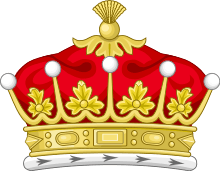 A Heraldic and Genealogical History of the Peerage. J. Burke (1836). A Genealogical and Heraldic History of the Commoners of Great Britain and Ireland, volume 3. C.E.H. Chadwyck-Healey (1901). The History of the Part of West Somerset Comprising the Parishes of Luccombe, Selworthy, Stoke Pero, Porlock, Culbone and Ore.
J. Burke and J.B. Burke (1841). 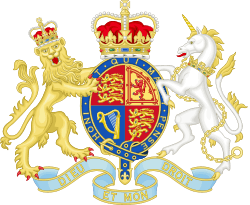 A Genealogical and Heraldic History of the Extinct and Dormant Baronetcies of England, Ireland, and Scotland. G.E. Cokayne (1892). Complete Peerage, 1st edition, volume 4. G.E. Cokayne (1893). Complete Peerage, 1st edition, volume 5. G.E. Cokayne (1896). Complete Peerage, 1st edition, volume 7. G.E. Cokayne (1902). Complete Baronetage, volume 2. F.W. Weaver and C.H. Mayo (eds.) (1895). Notes and Queries for Somerset and Dorset, volume 4. G.E. Cokayne (1892). "Complete Peerage", volume 13. page 156. This article incorporates text from a publication now in the public domain: Chisholm, Hugh, ed. (1911). "Spencer, John Charles Spencer, 3rd Earl". Encyclopædia Britannica. 25 (11th ed.). Cambridge University Press. Lee, Sidney, ed. (1898). "Spencer, John Charles". Dictionary of National Biography. 53. London: Smith, Elder & Co.
Wasson, Ellis Archer (1987) Whig Rennaisance: Lord Althorp and the Whig Party 1782–1845. 439 p.; London: Garland.